The makers recently confirmed that Bharat Ane Nenu will be release worldwide on April 20th, 2018 after an amicable understanding with the producers of Allu Arjun’s Naa Peru Surya. Superstar Mahesh Babu will next be seen in a political drama titled Bharat Ane Nenu which is being directed by Siva Koratala. The two had earlier collaborated for Srimanthudu which was one of the biggest blockbusters in Mahesh’s career. Expectations on Bharat Ane Nenu are quite high and is expected to do similar business of Srimanthudu. The makers had announced the title of the film on Republic Day this year keeping in mind the theme of the film and the prominence of Republic Day. And much to the joy of the fans of superstar Mahesh, the makers have now confirmed the teaser release date of Bharat Ane Nenu. Siva Koratala took to his social networking page and confirmed that the teaser of Bharat Ane Nenu will be out on March 6th, 2018. 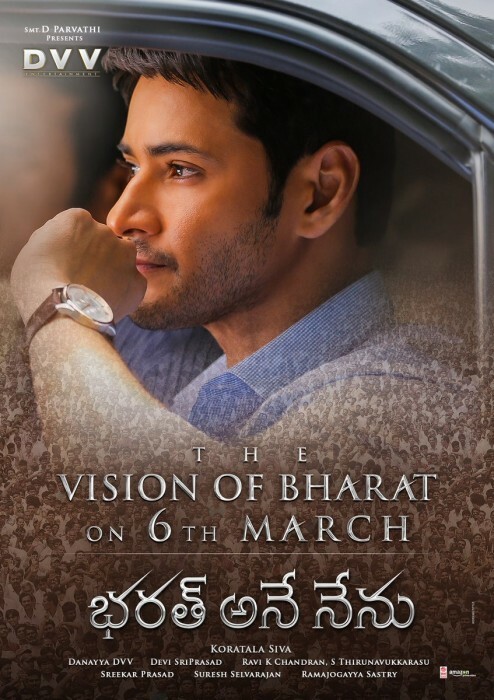 “The Vision of Bharat on Mar 6th. He’s truly responsible and accountable,” wrote Siva Koratala. The makers recently confirmed that Bharat Ane Nenu will be release worldwide on April 20th, 2018 after an amicable understanding with the producers of Allu Arjun’s Naa Peru Surya. Earlier, both these big-ticket films were heading towards a clash releasing on the same date. A while ago, a photo of Mahesh Babu from the shooting location of the film had gone viral and many had assumed that the photo was the first look of the film. However, director Siva Koratala clarified that the picture was a leaked image and not the first look poster requesting everyone to not spread it.